In February 2018 Shadow, Wilma, My Mom, and I Adventured to Crescent Beach. Crescent Beach is a beach on the Atlantic Ocean in Cape Elizabeth, Maine. It is one mile long beach with a gentle surf, popular for swimming, boating, and fishing. In April of 2014, Shadow, Buster, My Mom and I Adventured to Nickerson State Park in Brewster, Massachusetts, a town in Cape Cod. Brewster State Park is a Public Recreation Area with over 1,900 acres of land. It is popular for camping, fishing, boating, wooded trails, and swimming. We had a magnificent Adventure to Nickerson State Park in Brewster, Massachusetts. As you will know if you are a follower of my blog my memories of our Throwback Adventures is generally not as detailed as current posts. However, I remember absolutely loving this beautiful park. We found the perfect trail around one of the gorgeous ponds, with spots along the path to sit and relax. The boys enjoyed some swims, naps along the way, and of course an energetic hike. I was inspired by the boys’ desire for numerous swims, so I decided to wade far in the water (in my jeans!) so the boys could enjoy the nice refreshing water. Glad my Mom was able to capture a shot of this moment. I was reminded in viewing the photographs how Buster always used to love chewing on sticks along our journeys. We sure do miss his enthusiasm for our Adventures! One of the reasons I really do love sharing our Throwback Adventures. Nickerson State Park was definitely a lovely location, and I do hope to visit again in the future. Yesterday Shadow, Wilma and I Adventured to Winter Island Park in Salem, Massachusetts. This is the second time Shadow and I have visited this Park, while the first trip for Wilma. Winter Island Park encompasses: camping opportunities, Waikiki Beach, Fort Pickering and the Historic Fort Pickering Lighthouse. Fort Pickering is a 17th Century Fort which was the coastal defense and military barracks for Salem Harbor. Fort Pickering Lighthouse was later built adjacent to the Fort in 1871. We had a refreshing Adventure to Winter Island Park on a sunny Winter day. Shadow and I had been to the Park once before, and I soon had memories flashing through my mind. Our initial visit was the first new Adventure we journeyed to after Buster had passed. Our hearts were heavy but it was wonderful seeing Shadow enjoy a new Adventure. Both our trips occurred on December days. On our trip yesterday we were pleased to see the sun was out, although not ideal for photographs, it definitely lead to the perfect beach day. We began our visit traversing the trail along the coast. We stopped at the docks, and at the beach areas along the way. The sand was covered with shells, and the sun beautifully shimmering on the sea. We took our time, Shadow and Wilma enjoying some rolls, digging, and play-time along the way. After traversing the trails, and exploring the beach areas we wandered around Fort Pickering. The Fort was simple, but scenic, lots of crannies to explore. We walked around the area before heading back to the trails along the shore. The trails wound up and down along the coast, and above the Fort. Trees lined the trails, making for picturesque scene, although dull Winter brown, pops of red were found here and there. We veered off to the rocks several times checking out the lovely view. We then continued to the wreath adorned lighthouse, practicing poses for our Christmas card. We hopped from rock to rock, getting as close to the lighthouse as possible. After stopping at various views we then returned to the larger beach area to relax, swim, dig, and run. The waves and seagulls creating a lovely, therapeutic song. Although the Park was quite simple, we had a wonderful afternoon in the sun. There were few visitors to the Park, the perfect off-season perk. We definitely chose the perfect afternoon to explore Winter Island Park. (Rating: 3). Shadow, Buster, and I (and my Mom on several occasions) have enjoyed many Adventures to the Salisbury Beach State Reservation in Salisbury, Massachusetts. This Beach overlooks the area where the Merrimack River joins the Atlantic Ocean. It is a popular area for swimming, camping, picnicking, and boating. There is a fee to enter the Park, although state park passes are accepted. We have had numerous Adventures to Salisbury Beach State Reservation. 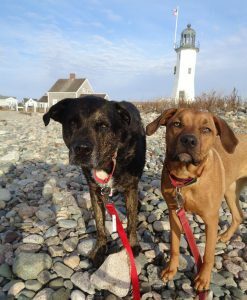 It is one of the few Massachusetts Beaches that permits dogs in ALL months of the year ALL times of the day. Dogs are allowed on one part of the Reservation I think referred to as the “River Side”. With construction views, a cement barrier, and a small Beach, the area is not greatly picturesque. It therefore is far from my favorite Beach, however it has allowed my best friends to join me on the shore, making for many memorable Adventures. I think our visits to Salisbury Beach State Reservation began when I first left Florida, definitely missing a gorgeous beach experience. I sought out to find that perfect beach, really an impossible task. So I soon started taking regular trips to Salisbury Beach State Reservation, providing me at least some sand, and waterfront time with my best friends! Over the years we have had wonderful times exploring Salisbury Beach State Reservation. We especially enjoyed the sunset evenings, lots of digging, swims, rolls, and enthusiastic play. We really are energized and inspired by our time on the Beach, always a refreshing visit. So below you will see photographs from our various different trips, all mixed together for one Beach collage (Rating: 3). In June 2014 Shadow, Buster, and I Adventured to Noanet Woodlands in Dover, Massachusetts. Noanet Woodlands has approximately 600 acres of trails featuring woodlands, ponds, a peak, and a former mill site. It is popular for skiing, hiking, biking, and bird watchers. We had a refreshing Adventure to Noanet Woodlands in June of 2014. If you follow my blog you are well aware that my Throwback memory can sometimes be limited in detail. This visit was definitely one of those cases as I amazingly I do not remember it all! However, it is clear by the photographs I have gathered that we had a pleasant trip, that would be beneficial to share with others who love dog-friendly outdoor spots. The pictures I tracked down indicate a swim-filled Adventure, with lots of off-leash fun, woodsy trails, and a stop to the peak. We even found a unique rock along the trails. It was so fun watching my boys swim, and hike together, and this journey was no exception. We sure do miss our Buster, leading to another reason I love to share my Thursday Throwback Adventure, even the simple ones. Below you will see the photographs I could locate from our Adventure to Noanet Woodlands. I think a likely spot we will return to in the future (Rating: Unavailable). Yesterday Shadow, Wilma and I Adventured to Maudslay State Park in Newburyport, Massachusetts. This was our second visit to the Park as Shadow, Buster and I had Adventured there back in May 2015. Maudslay State Park is the former estate of the Moseley family, and is located along the Merrimack River. It is known for its 19th century gardens, meadows, pines, and as one of the largest naturally-occurring stand of mountain laurels in Massachusetts. It is popular for hiking, cross country skiing, picnicking, horseback riding, and summer concerts. We had a nice Adventure to Maudslay State Park on a sunny, Fall day. We arrived to find the parking lot packed with people, many with dogs in tow. Soon out of the car I was greeted by a woman searching for a missing dog. I viewed the photo and hoped for the best, keeping my eyes out for sweet little Ellie, throughout the day. My heart weighed heavy as we began our afternoon hike. We peaked at the map before following the masses, pleased to soon find ourselves away from the crowd on a woodsy, tree-lined trail. I had printed a map, which clearly labeled the trails but soon found we were on a complex trail system with no names,or colors to direct us in our hike. So I decided to remember where we had walked, noticing little details along the trail. I was thrilled to eventually find the water, and a trail leading to the shore’s edge. We ambled along the water trail, finding a cute little bridge with a River view. The water’s edge was iced, as well as some of the rocks along the shore. It crackled as we walked bye, adding sweet nature sounds to the air. This was my favorite part of our hike today, adding color, and variety to the trails. Yesterday, Shadow, Wilma, and I Adventured to Natural Bridge State Park in North Adams, Massachusetts. The park was named for the marble bridge, the only natural marble bridge in North America. The Bridge spans the Hudson Brook. This marble bridge is estimated to be over 500 million years old. The arches are said to be carved by the forces of glacial melt many, many years ago. The Park also encompasses: a marble dam, marble quarry, and woodland walks. We had a frigid Adventure to the Natural Bridge State Park, on one, if not, the coldest Thanksgiving days ever! I attempted to walk quickly, to warm up, but of course the pups wanted to smell every spot along the way. So we took our time, ambling up the road to the bridge. Along the way there were small water features, and waterfalls, scattered with beautiful ice features. It did not take us long to get to the marble bridge. It was a scenic backdrop to the snow. Wilma seemed especially enthused encouraging Shadow to play as I took a video and some photographs.